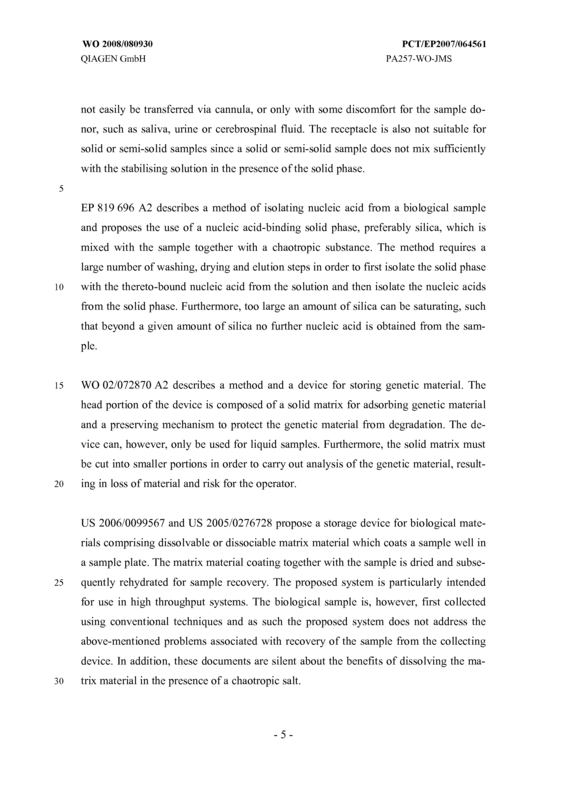 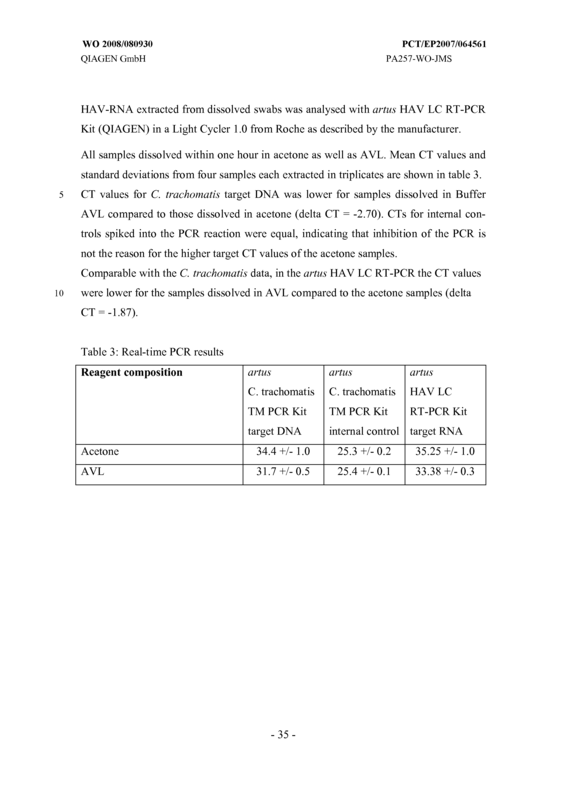 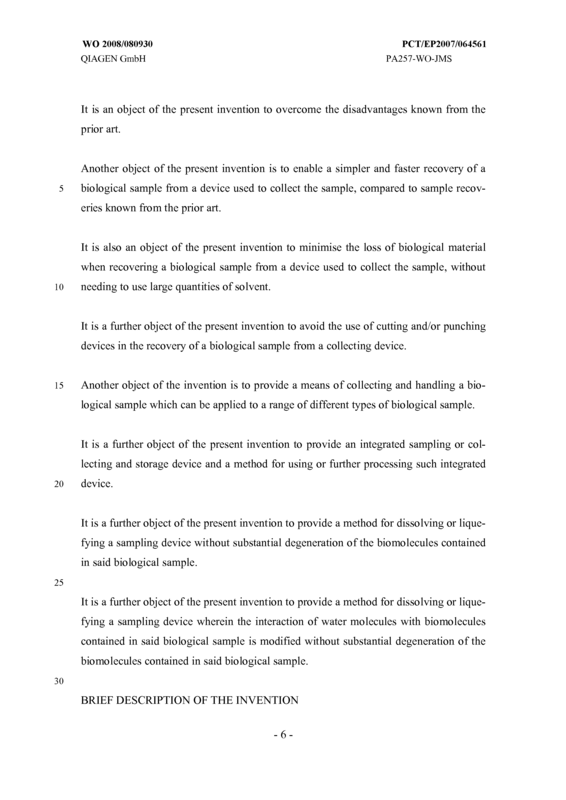 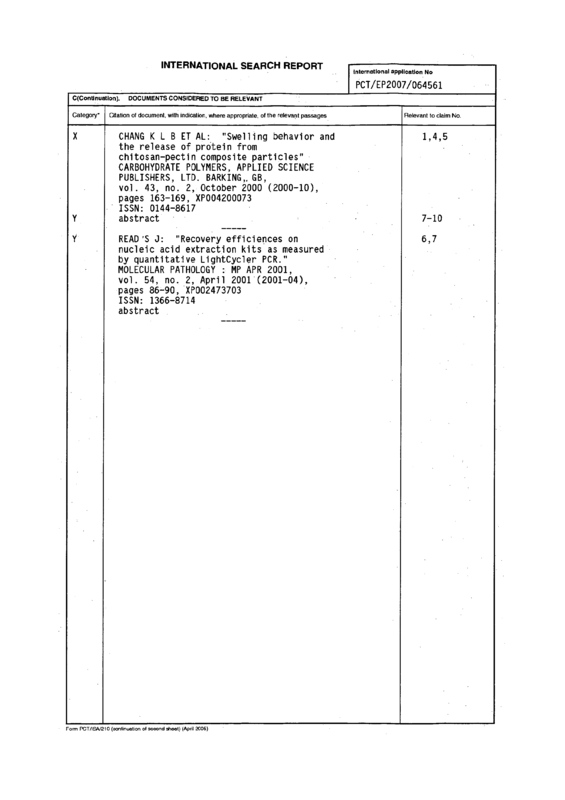 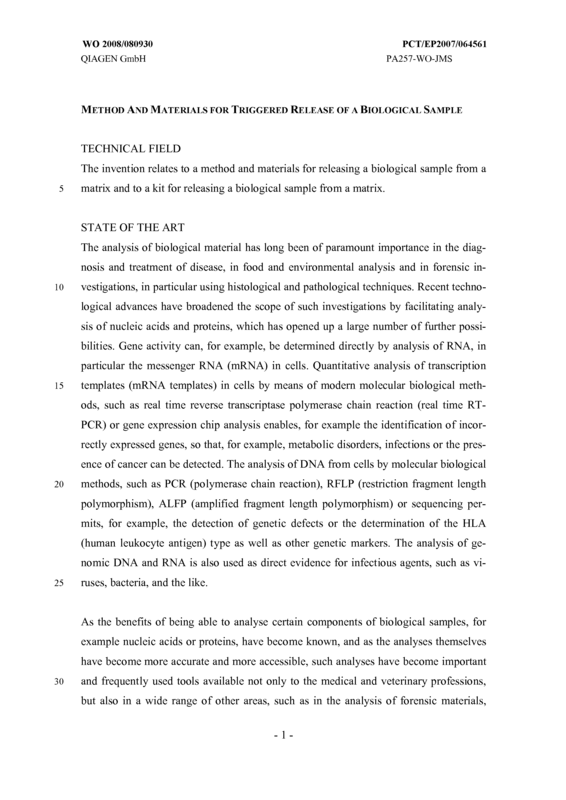 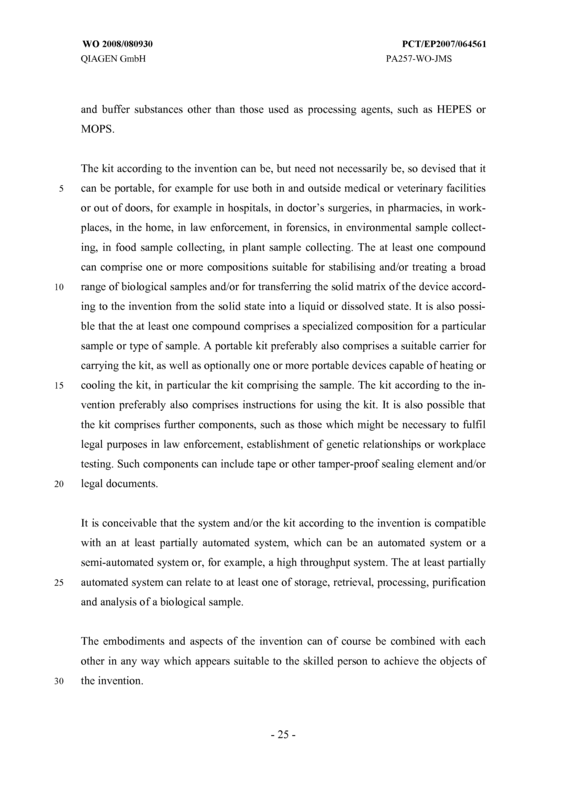 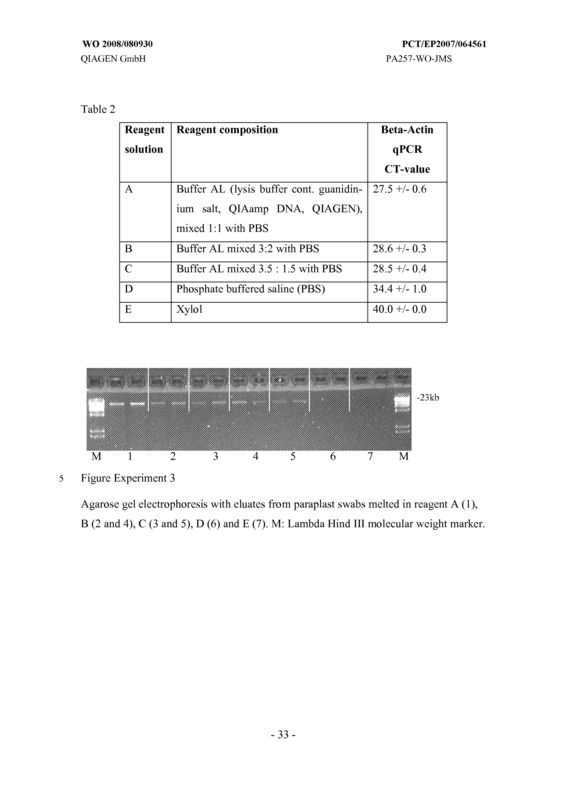 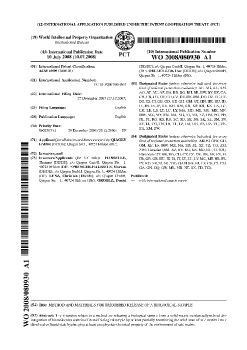 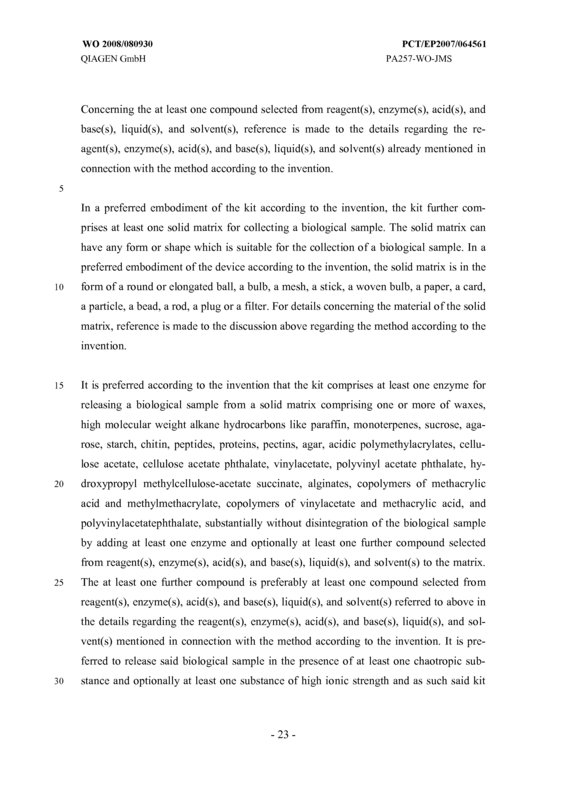 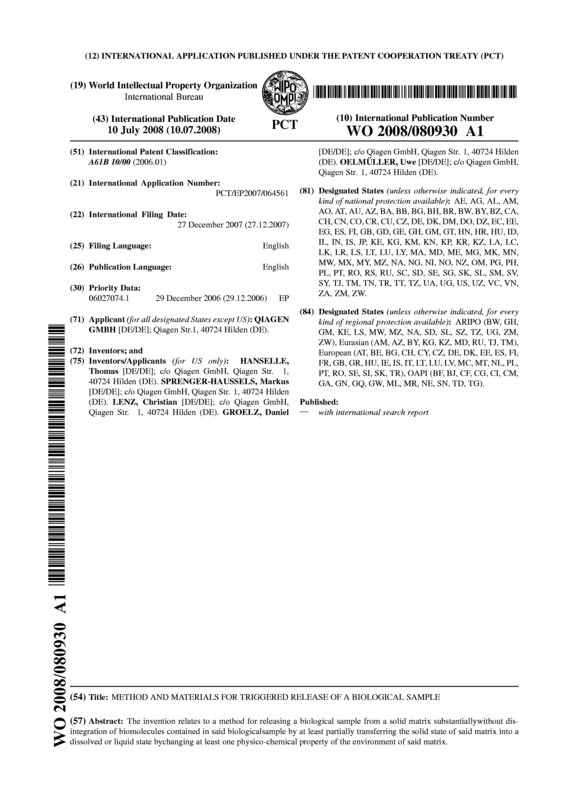 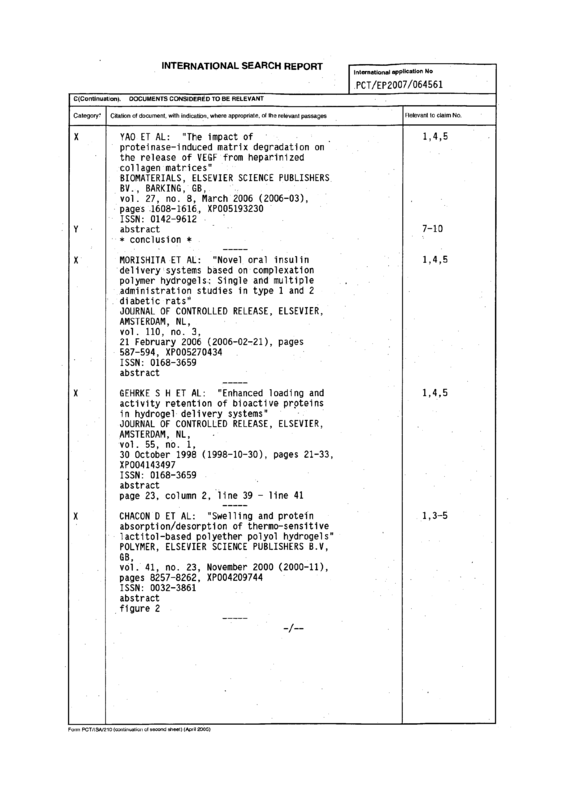 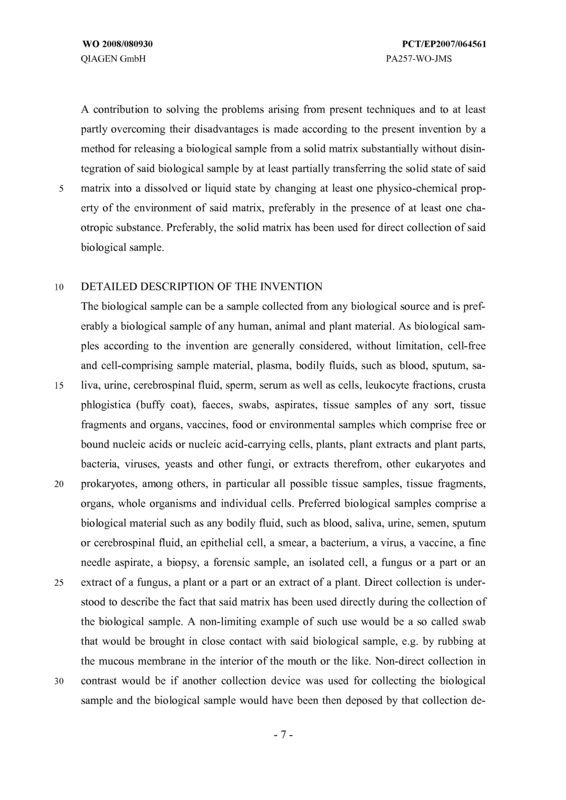 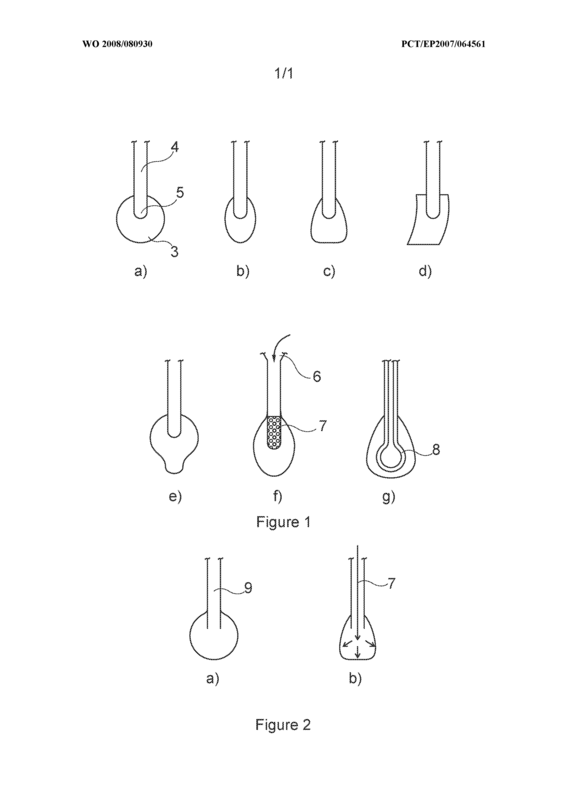 The invention relates to a method for releasing a biological sample from a solid matrix substantiallywithout disintegration of biomolecules contained in said biologicalsample by at least partially transferring the solid state of said matrix into a dissolved or liquid state bychanging at least one physico-chemical property of the environment of said matrix. 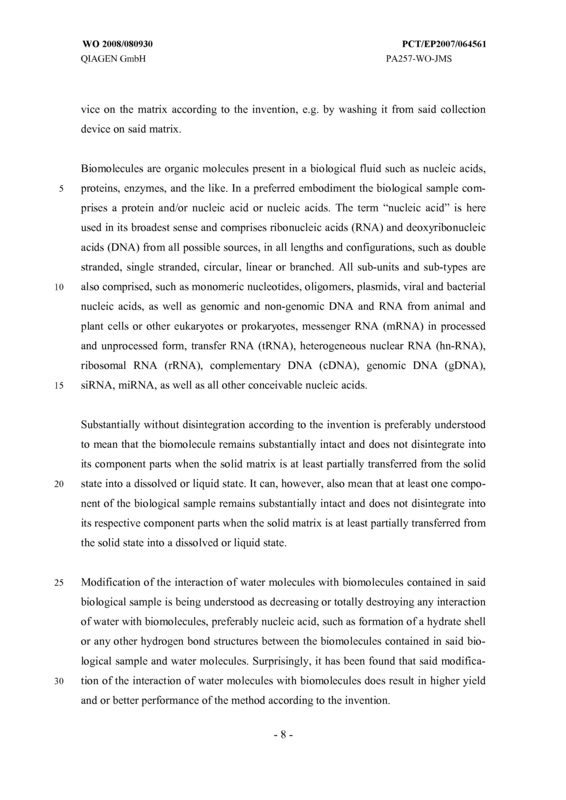 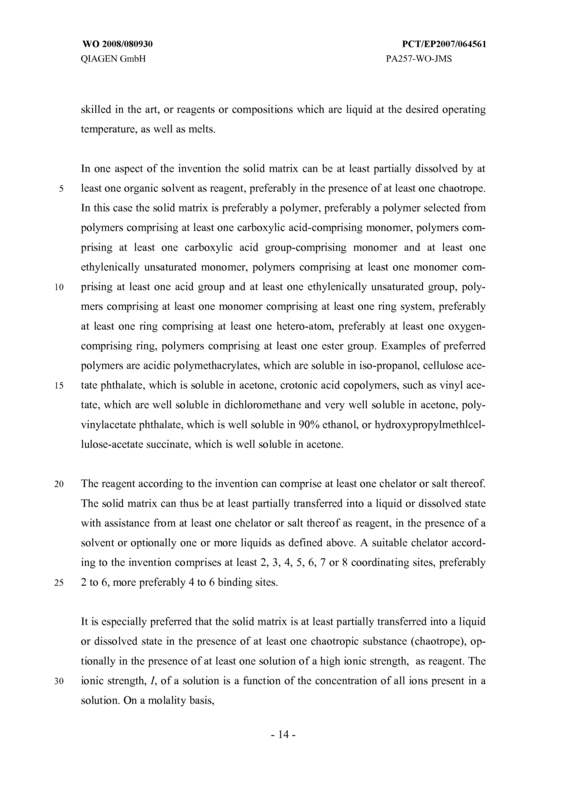 A method for releasing a biological sample directly collected on a solid matrix from said matrix substantially without disintegration of bio molecules comtained in said biological sample by at least partially transferring the solid state of said matrix into a dissolved or liquid state by changing at least one physico-chemical property of the environment of said matrix. 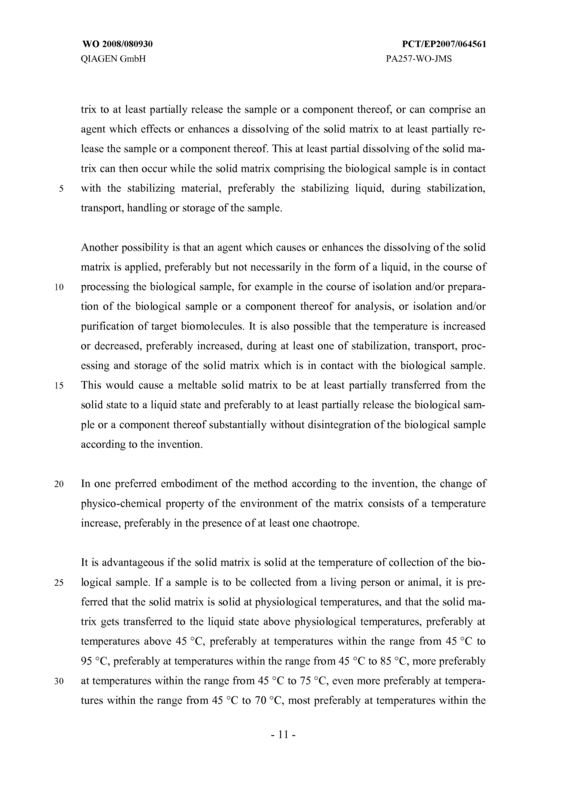 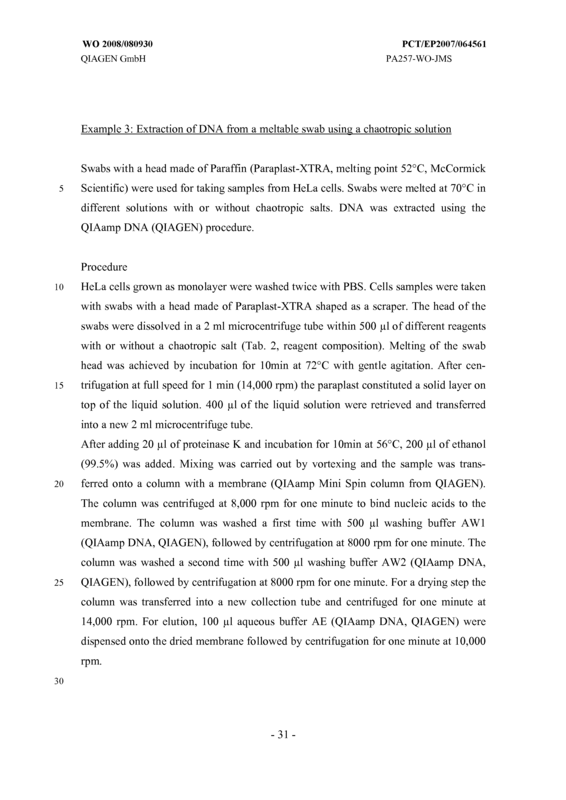 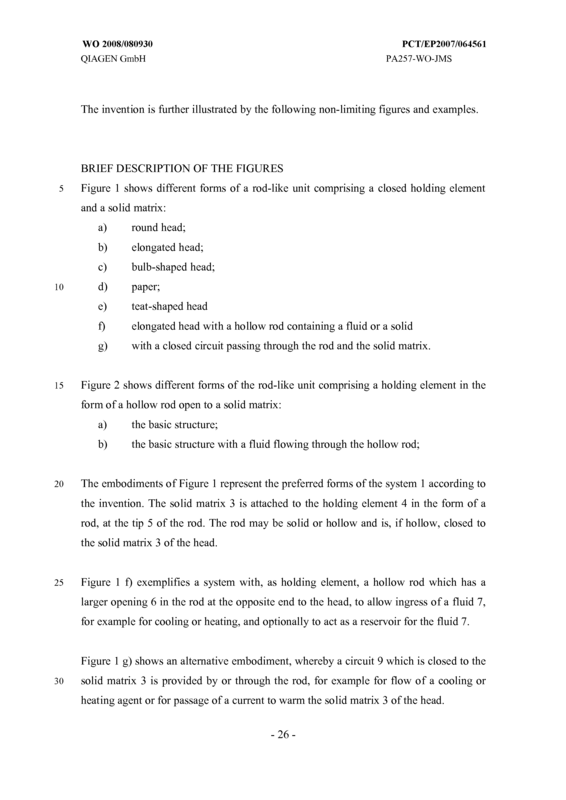 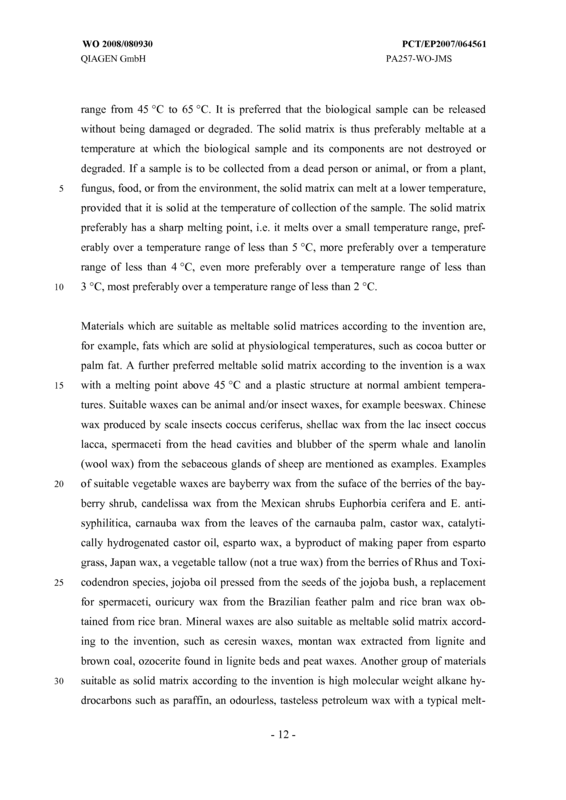 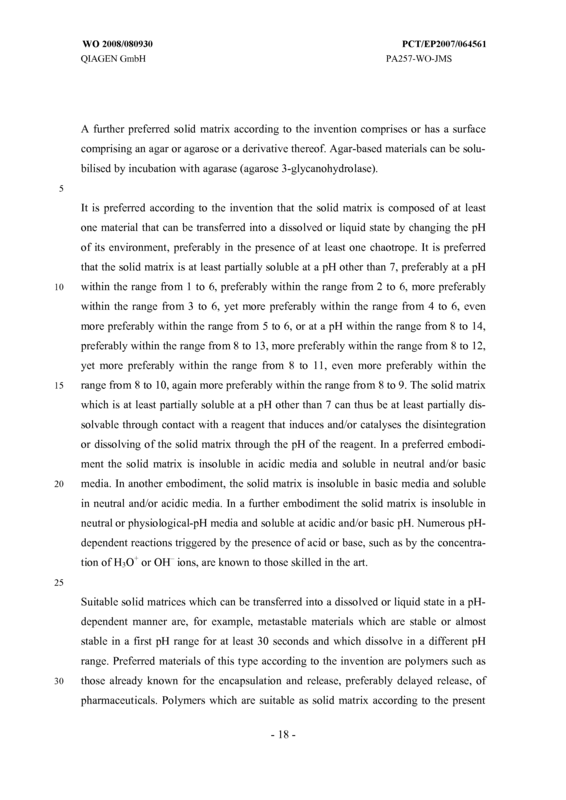 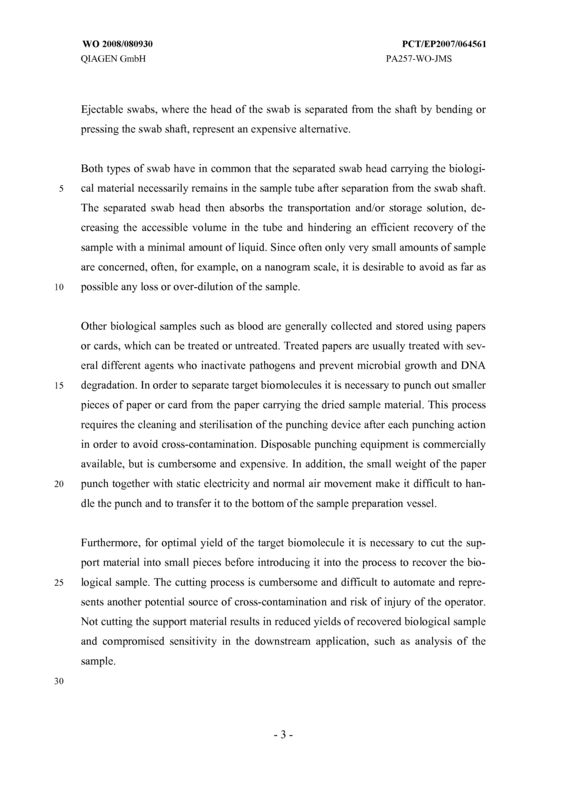 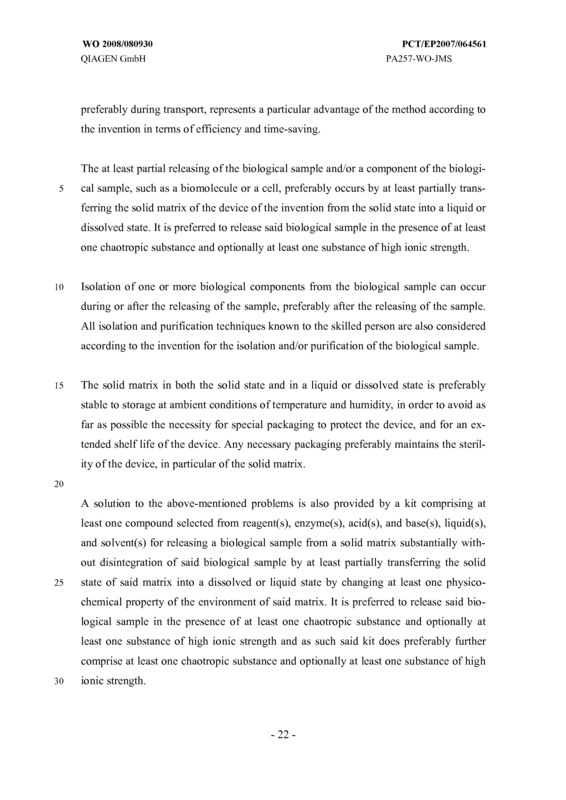 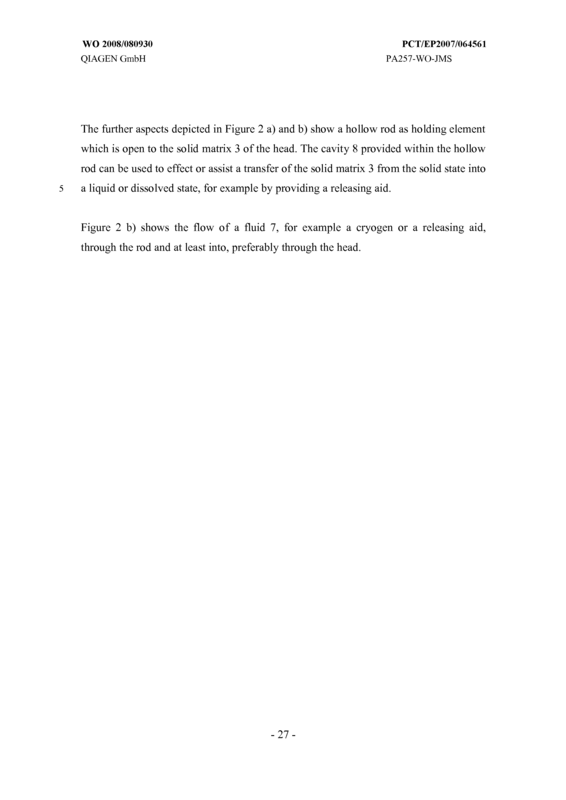 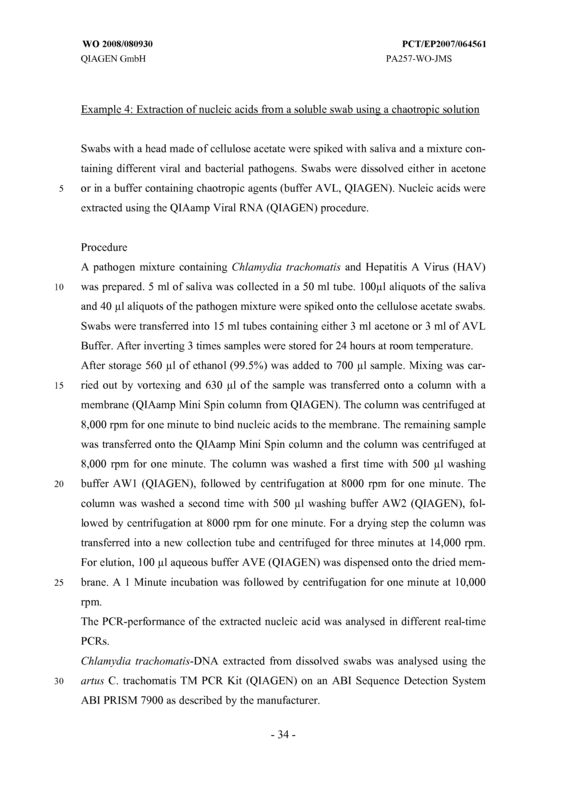 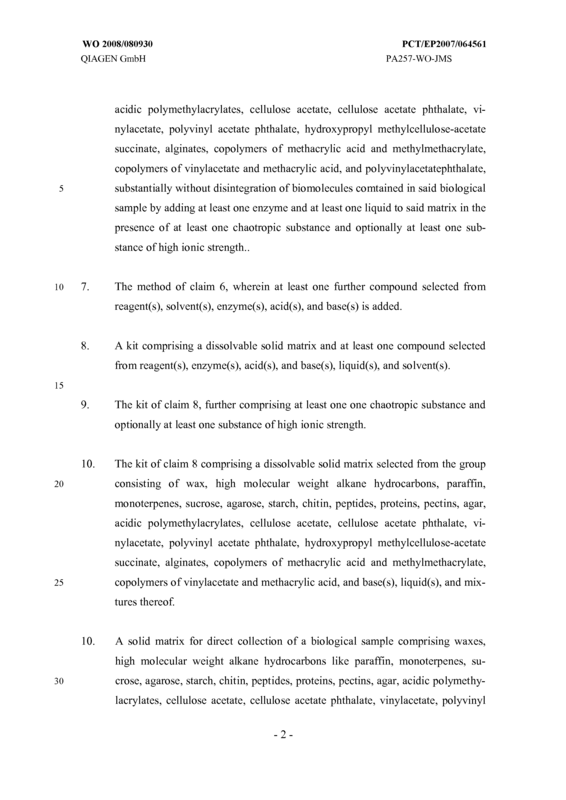 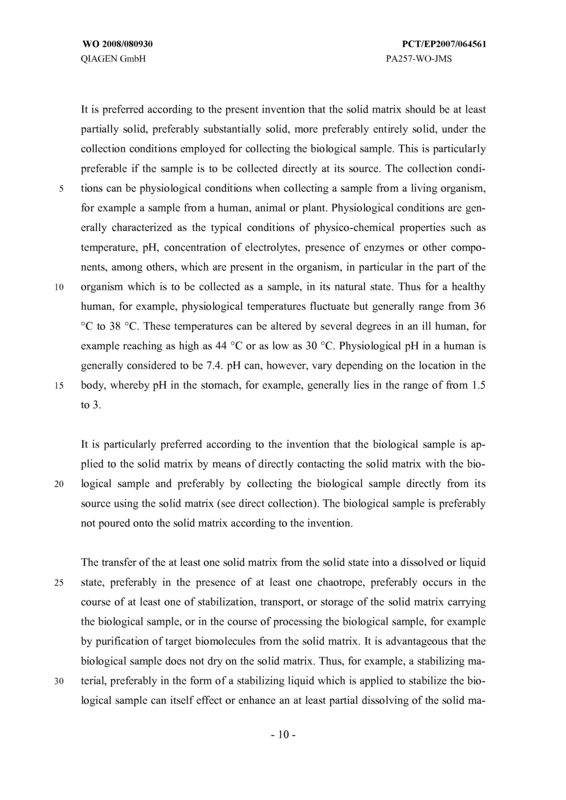 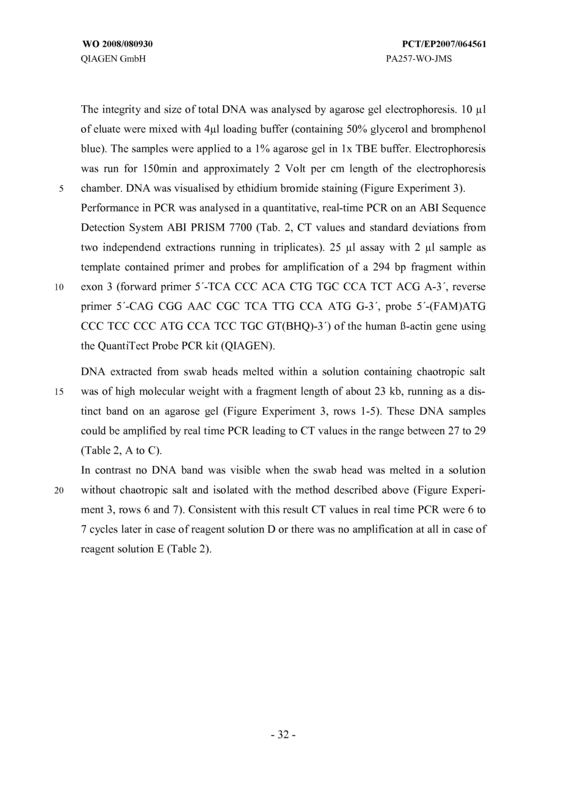 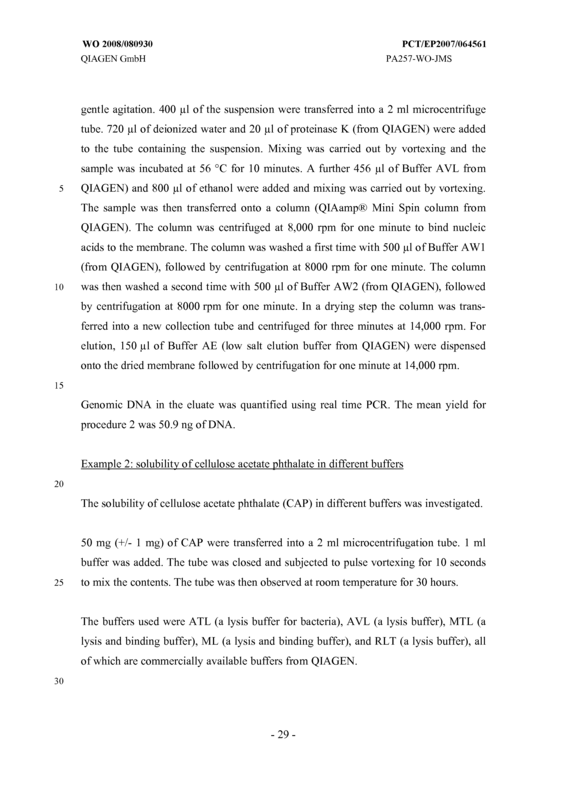 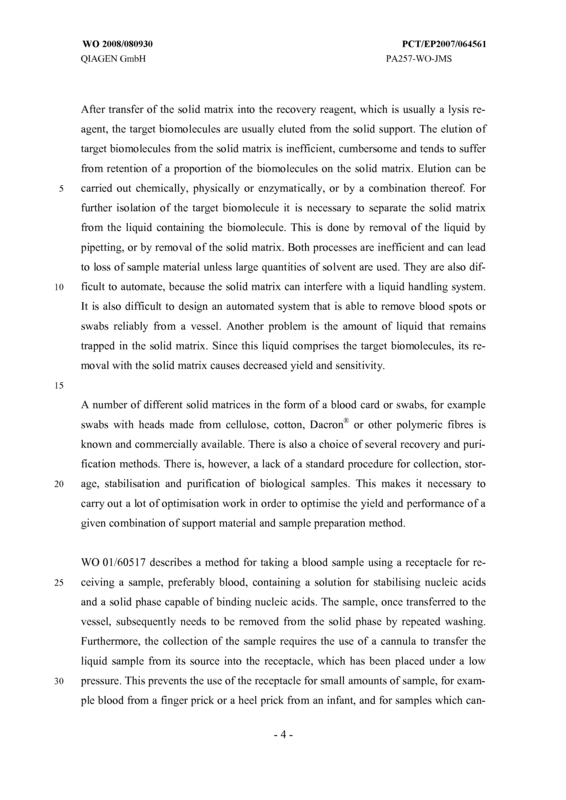 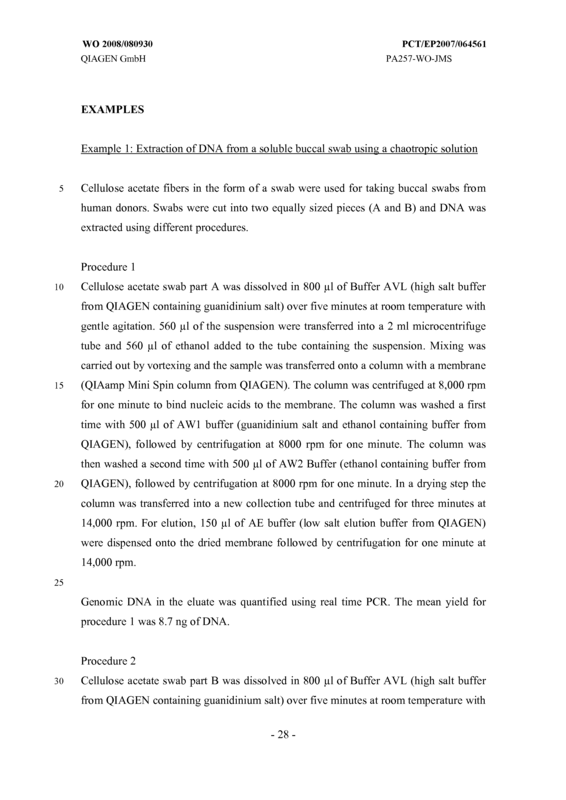 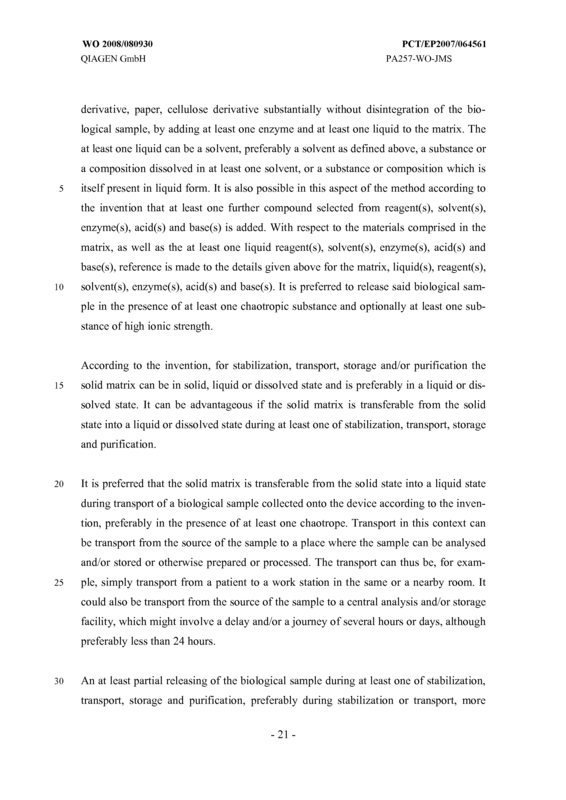 A method for releasing a biological sample from a solid matrix substantially without disintegration of bio molecules contained in said biological sample by at least partially transferring the solid state of said matrix into a dissolved or liquid state by changing at least one physico-chemical property of the environment of said matrix in the presence of at least one chaotropic substance optionally in the presence of at least one substance of high ionic strength. 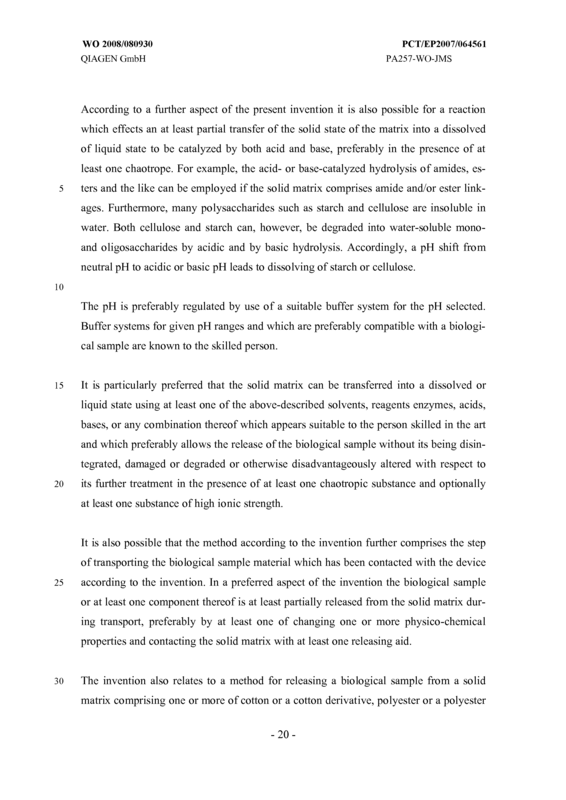 The method according to claim 1 or 2, wherein said change of physico-chemical property of said environment consists of a temperature increase. 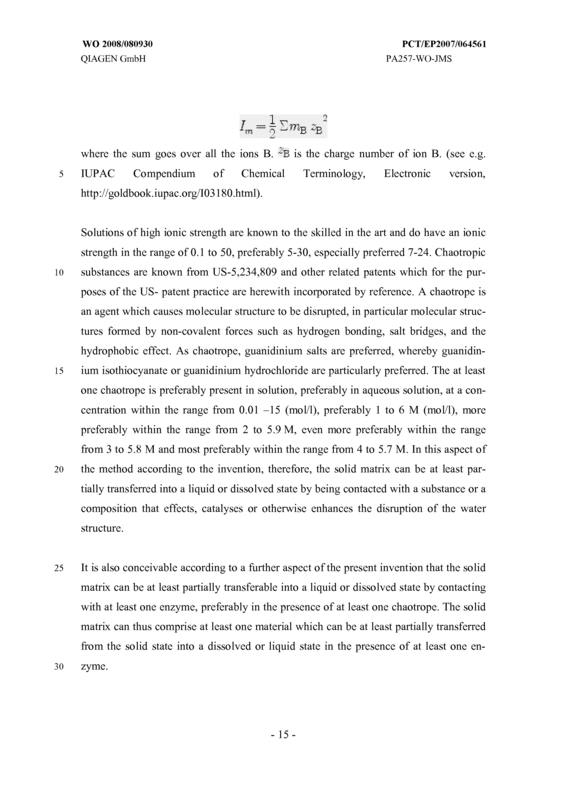 The method according to claim 1 or 2, wherein said change of physico-chemical property of said environment consists of addition of a solvent and optionally at least one compound selected from reagent(s), enzyme(s), acid(s), and base(s). 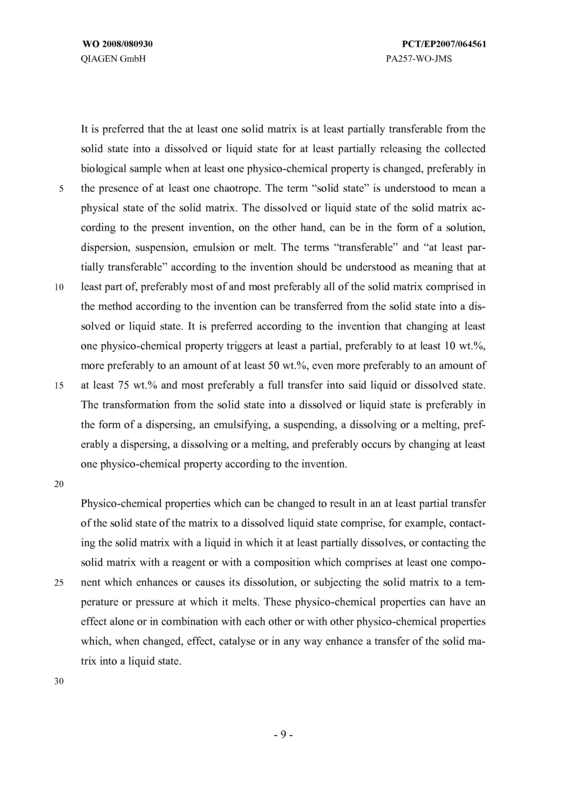 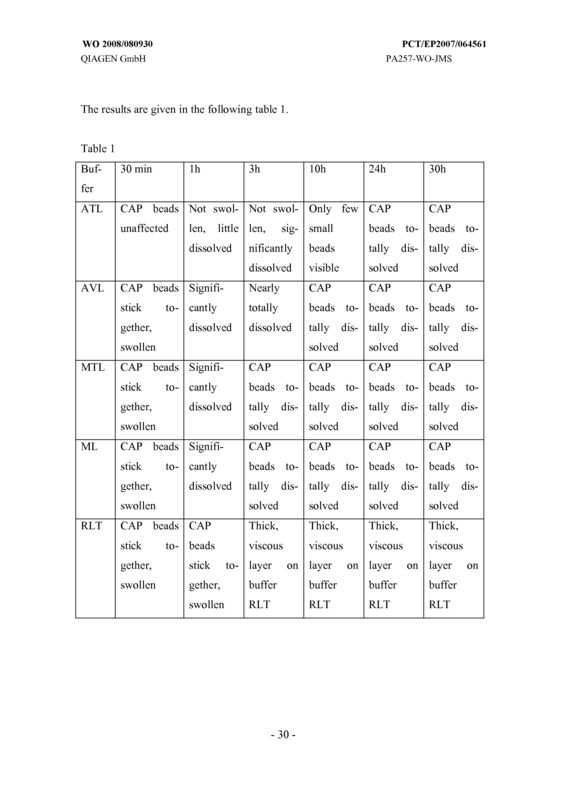 The method according to claim 1 or 2, wherein said change of physico-chemical property of said environment consists of addition of at least one compound selected from reagent(s), enzyme(s), acid(s), and base(s) and optionally one or more liquids. 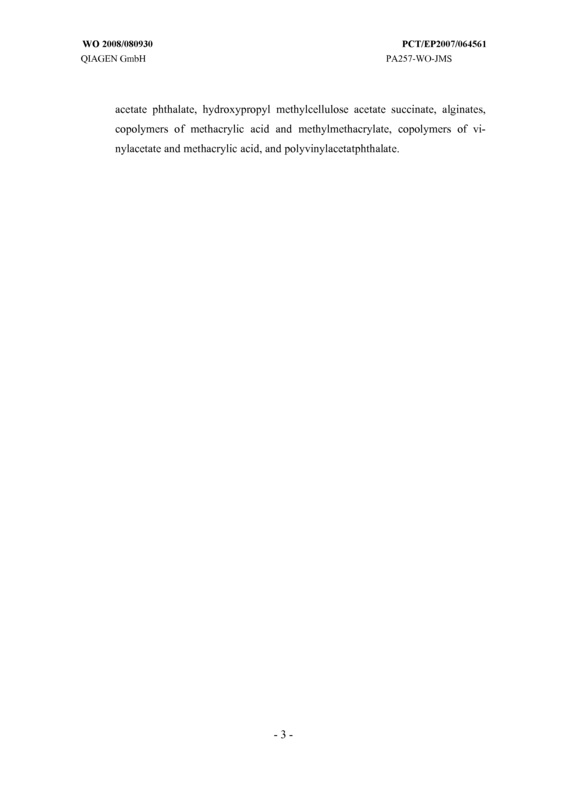 acidic polymethylacrylates, cellulose acetate, cellulose acetate phthalate, vi- nylacetate, polyvinyl acetate phthalate, hydroxypropyl methylcellulose-acetate succinate, alginates, copolymers of methacrylic acid and methylmethacrylate, copolymers of vinylacetate and methacrylic acid, and polyvinylacetatephthalate, substantially without disintegration of bio molecules comtained in said biological sample by adding at least one enzyme and at least one liquid to said matrix in the presence of at least one chaotropic substance and optionally at least one substance of high ionic strength.. 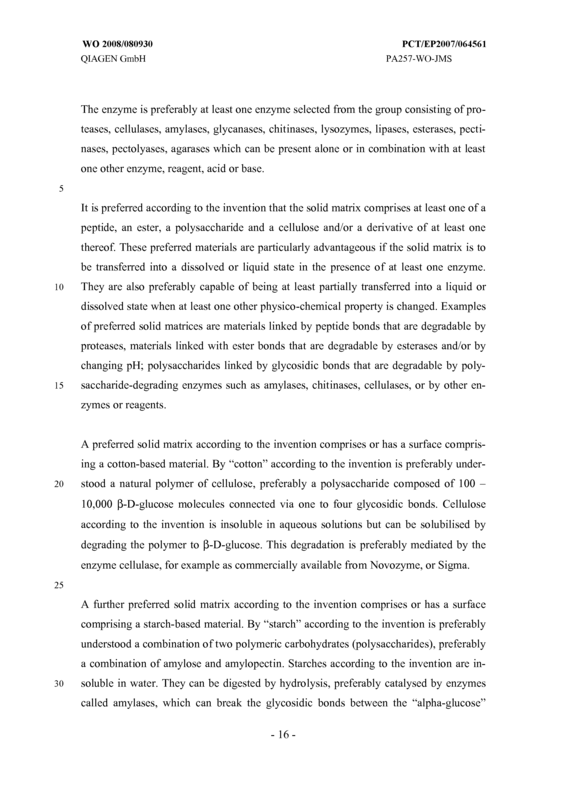 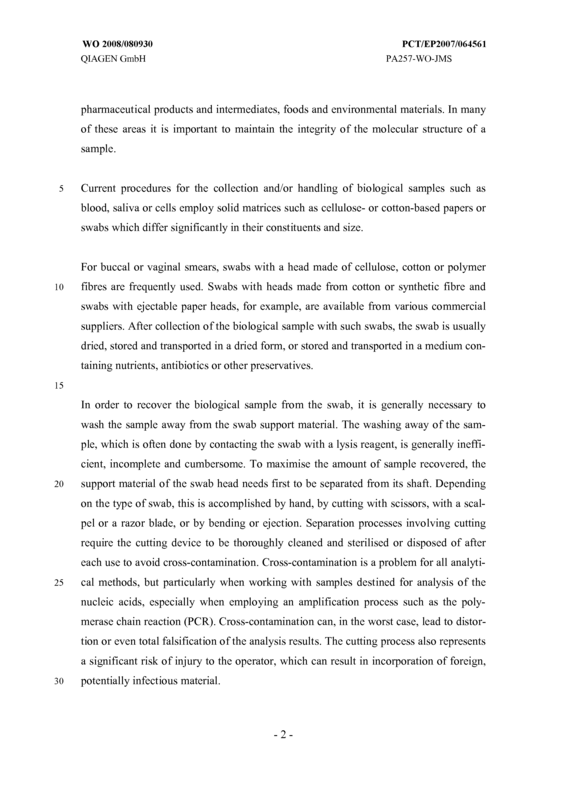 The method of claim 6, wherein at least one further compound selected from reagent(s), solvent(s), enzyme(s), acid(s), and base(s) is added. 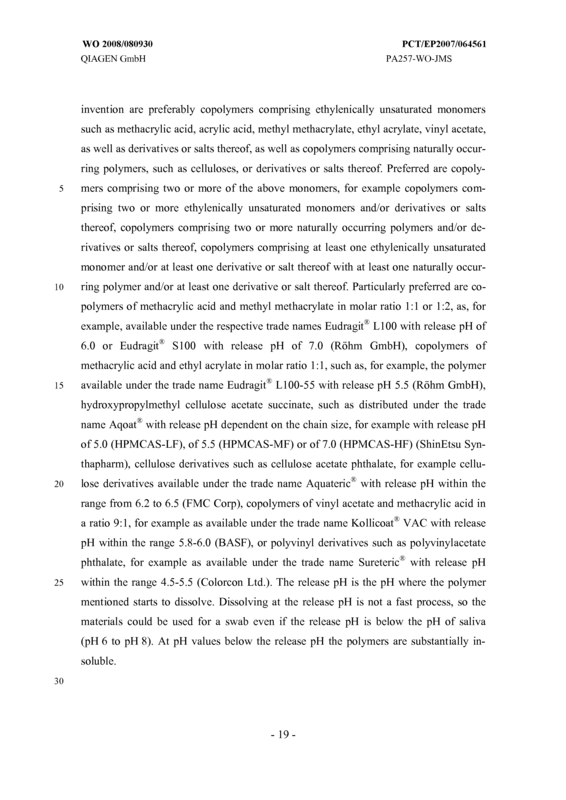 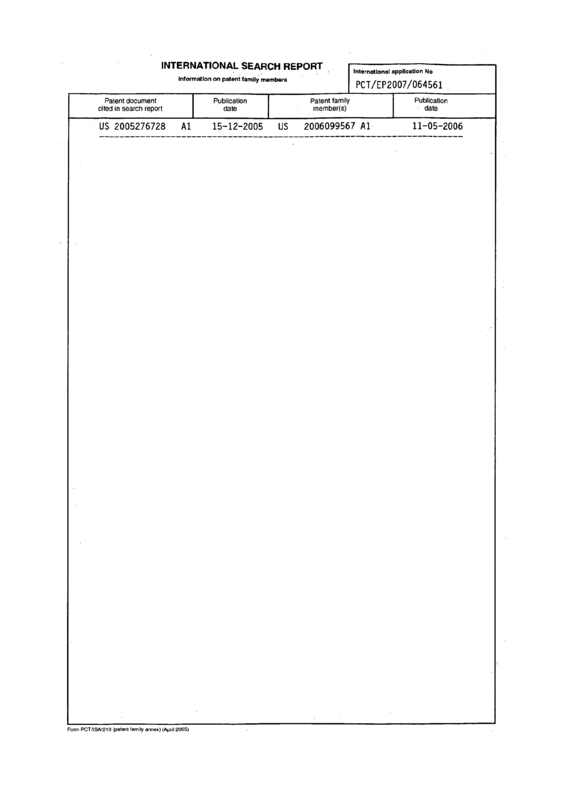 A kit comprising a dissolvable solid matrix and at least one compound selected from reagent(s), enzyme(s), acid(s), and base(s), liquid(s), and solvent(s). 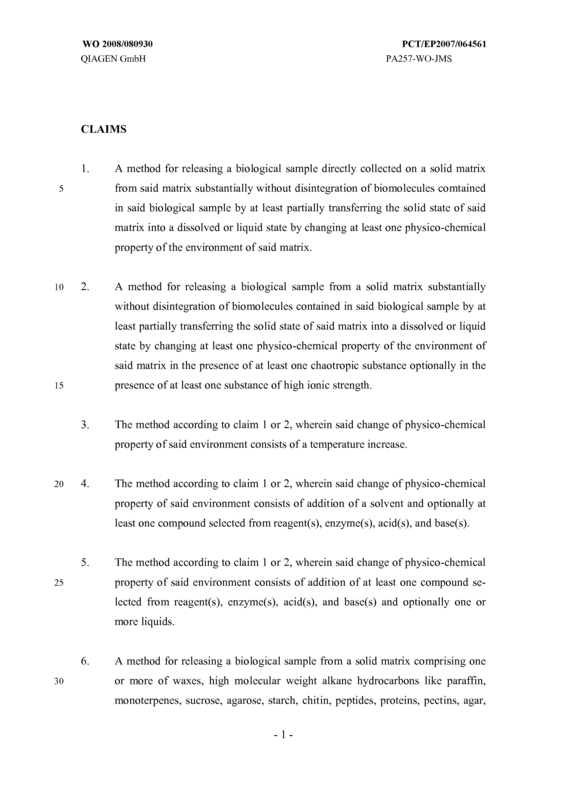 The kit of claim 8, further comprising at least one one chaotropic substance and optionally at least one substance of high ionic strength. 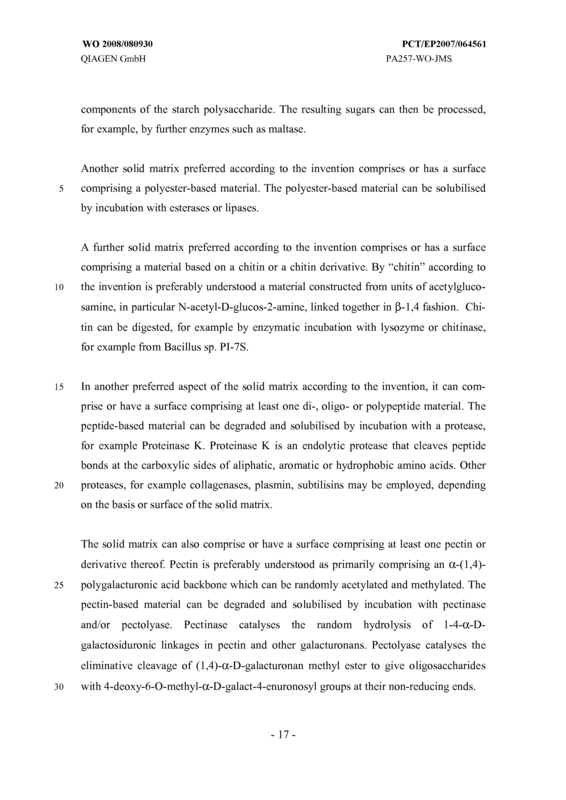 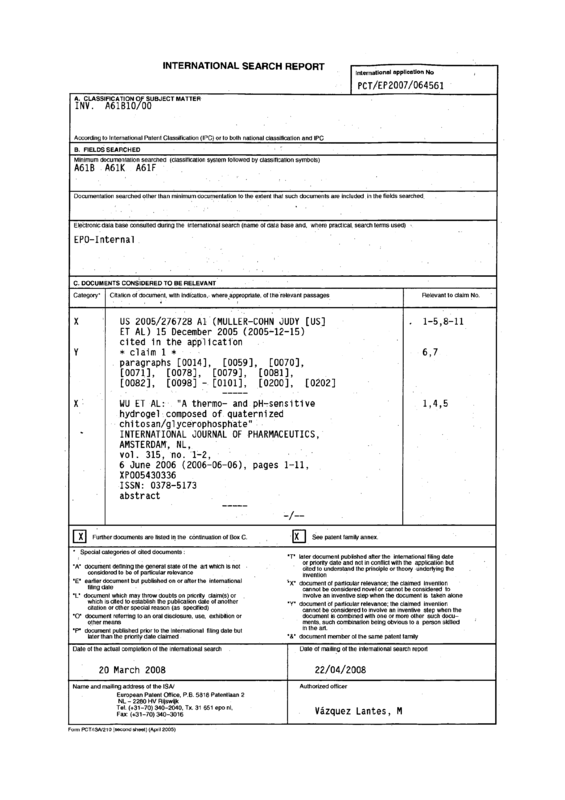 The kit of claim 8 comprising a dissolvable solid matrix selected from the group consisting of wax, high molecular weight alkane hydrocarbons, paraffin, monoterpenes, sucrose, agarose, starch, chitin, peptides, proteins, pectins, agar, acidic polymethylacrylates, cellulose acetate, cellulose acetate phthalate, vinylacetate, polyvinyl acetate phthalate, hydroxypropyl methylcellulose-acetate succinate, alginates, copolymers of methacrylic acid and methylmethacrylate, copolymers of vinylacetate and methacrylic acid, and base(s), liquid(s), and mixtures thereof. 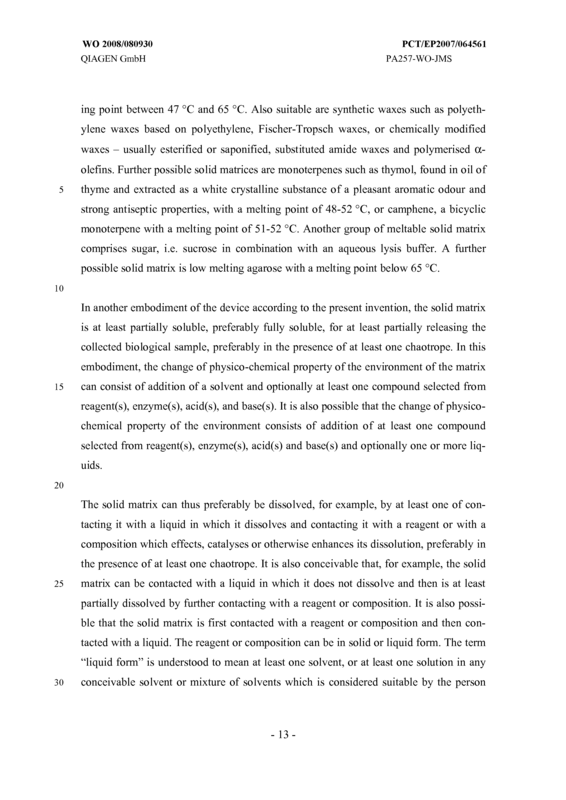 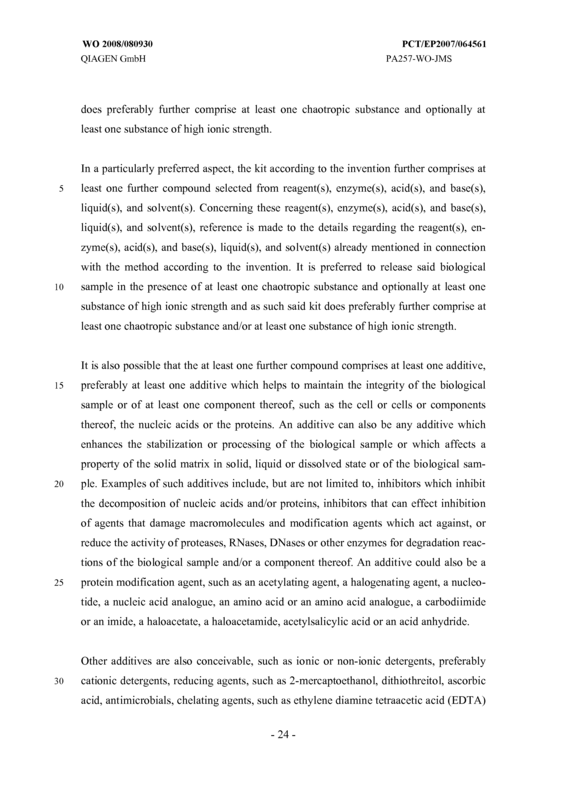 acetate phthalate, hydroxypropyl methylcellulose acetate succinate, alginates, copolymers of methacrylic acid and methylmethacrylate, copolymers of vi- nylacetate and methacrylic acid, and polyvinylacetatphthalate.